Originally intended as the first volume of a multivolume series, the later volumes were never published. "This book is excellent reading if you can find a copy. Intended originally as the first in a multi-volume set, it sets out clearly the basics of doubling and redoubling, including the maths for those who want to delve that deep, and examines racing doubles in great depth. Ward's refinement of the Thorp Count (the "Ward Count") is well worth knowing. "Chris Bray, in What Colour is the Wind? "Jeff's chapter on Racing Positions explains and compares several formulae for making cube decisions. He gives his own answers to several questions involved in measuring the length of the race. In offering cube advice on racing positions, Jeff gives the results of rolling the position out many times [by hand!]. He makes both good and bad suggestions for how roll out games. One of the merits of rolling out a position many times is that you get to see how a game of this sort progresses. What I would like to see is fuller attention to features of the positions, with an attempt to think through the proper cube decisions first, and the roll-outs brought in only later is a confirmation of the jedgments made independently. 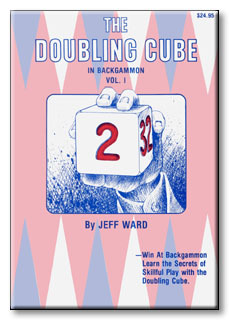 Jeff's book has some value for what it says about various types of positions, and some value as a reference work for both his benchmark roll-outs and his cube-action charts for 3-men versus 3-men endings. "Danny Kleinman, in Is There Life After Backgammon? COVER: Win at backgammon. Learn the secrets of skillful play with the doubling cube. The doubling cube explained in easy-to-understand terms. Dozens of positions analyzed with correct cube plays and winning probabilities (including gammons and backgammons) given for each side. Well-illustrated diagrams, tables, charts, and graphs. AUTHOR: Dr. Jeff Ward is a nationally known backgammon expert whose syndicated weekly backgammon column appears in over two dozen newspapers from coast to coast. Originally from the Kansas City suburb of Prairie Village, Kansas, Ward attended the University of Kansas and the University of Iowa, earning a Ph.D. from the latter school in 1973. Now a Californian, he has lived in San Diego for a number of years. Ward is a frequent contributor to backgammon's major periodicals: Backgammon Magazine, Backgammon Times, and Backgammon Guide. He is a member of Backgammon Magazine's elite "Committee of Experts," and was one of the original seven players chosen for this honor. The other charter members were Billy Eisenberg, chairman, Bob Ciaffone, Barclay Cooke, Danny Kleinman, Paul Magriel, and Bill Robertie. Ward's tournament successes include finalist, 1979 World Amateur Doubles Championship. His other backgammon writings include the book, Winning Is More Fun, scheduled to be published by Cornerstone Libraries in the Spring of 1983.